Oh um hi, I’m Tieghan and I’ve taken loving fall to a whole new level. No Seriously, I think I have an issue. I just realized that all of my recipe ideas for the next two months are SO fall-like that you guys might actually start to get annoyed with me. AND I have so many recipes I want to share with you that I wish I could post like two times a day. I mean, I would if I could, but I’m already a crazy person as it is, so adding more posts to my schedule really isn’t too realistic. Everything I have in mind for upcoming posts is either squash, pumpkin, apples, figs, pomegranate, brussels sprouts, stews, soups, PASTA 🙂 sweet potatoes….and well chocolate…of course. Everything is roasted, braised, charred, fried or mashed. It’s amazing. I love fall! Ahh, wait… it snowed this weekend…wait, what? I thought it was only October…no snow…please! Ok, so it only snowed on the mountain tops, but really I am not ready for that. I want my orange/yellow leaves to stay on the trees!! 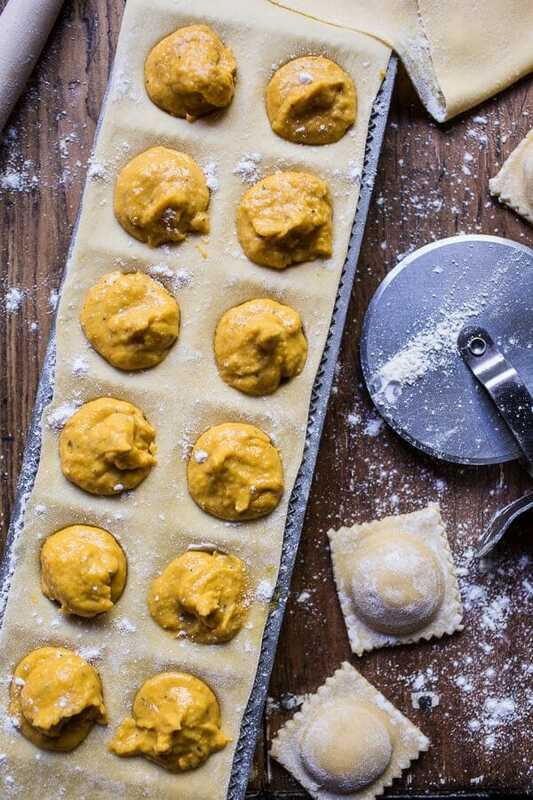 Not talking about snow though, talking about butternut squash and goat cheese ravioli! Oh but wait, I feel like I need to tell you a little about my weekend first. It was spent mostly trying to get work done while Asher and her friends ran around my small little house. Then I freaked when I walked into the pantry and saw all three of them on the very top shelf playing. OMG. Like what?!? I mean, it may be ok if it had just been Asher up there, but I was like responsible for two little girls and what if they fell?!? FYI, little girls need to be watched like hawks. Apparently they do things like crawl up on top shelves of pantries and play tea party…and then they destroy the rest of your house leaving it looking worse than after a full day of cooking. Basically what I’m trying to say is that little girls are terrors. OK and I am so not having kids for quite some time (obviously – think I need the guy first!). Personally, I like my quietness…my cleanliness…and my sanity. Just sayin. And that was my weekend in a nutshell. I also finally got Asher to watch Harry Potter. So far we’ve only gotten through the Sorcerer’s Stone since she needed to watch it twice to fully understand. Ahhh!! She’s gonna be a Harry Potter obsessed little girl soon though. So pumped!! Soo this ravioli! I am equally excited about this ravioli as I am about my little Harry Potter situation. This is my favorite ravioli. I make a version of it every year, but this year’s version is stealing the show. The goat cheese mixed with the roasted butternut squash and all stuffed into a pocket of homemade pasta dough is pure heaven. The torn sourdough oregano bread crumbs are like the icing on the cake, and of course, the browned butter just seals the deal. It’s the ultimate cozy autumn night meal. Perfect to serve for company, make in advance and freeze, or simply to eat all by yourself! 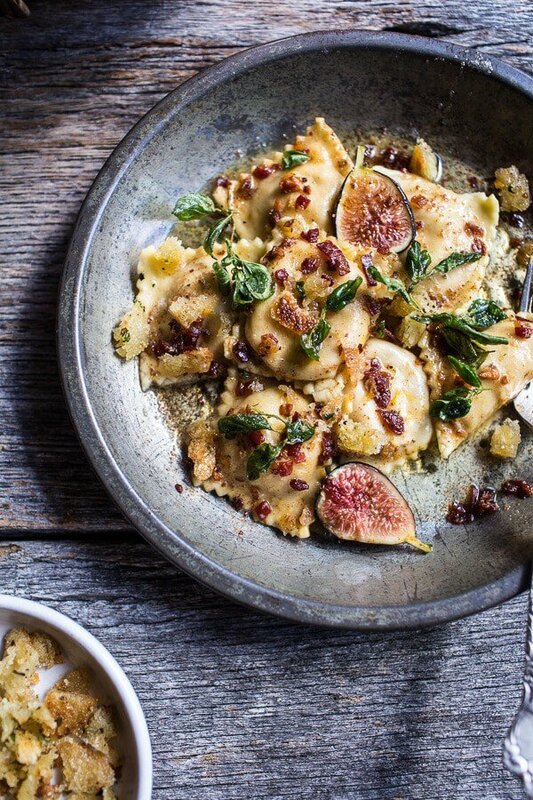 I also paired the ravioli with fresh figs because I’m slightly obsessed. Figs are my favorite this year. Ok and so is that drunken goat cheese that I just discovered my regular grocery store sells too. YES. <–Dreams coming true. Now if only I could find good fresh figs more easily. Ugh. Before he left for school, my brother and I made you all a kind of LONG, but pretty fun, and hopefully informative video on just how to make these ravioli. It’s nowhere near a perfect video, but slowly and surely we are learning!! I actually have a handful of videos coming up this month, so be on the lookout for them, and please, please, please let me know your thoughts in the comments! Butternut Squash and Goat Cheese Ravioli with Browned Butter + Oregano Bread Crumbs. 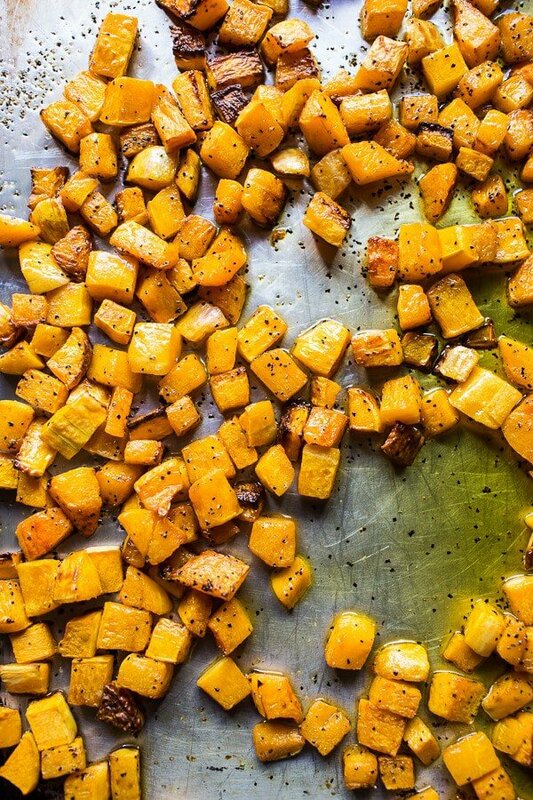 Peel the squash and cut into cubes and placing them on a baking sheet. Coat them with olive oil, salt & pepper. Roast the squash at 400 degrees for 45 minutes until tender. Allow to cool for 15 minutes or so. 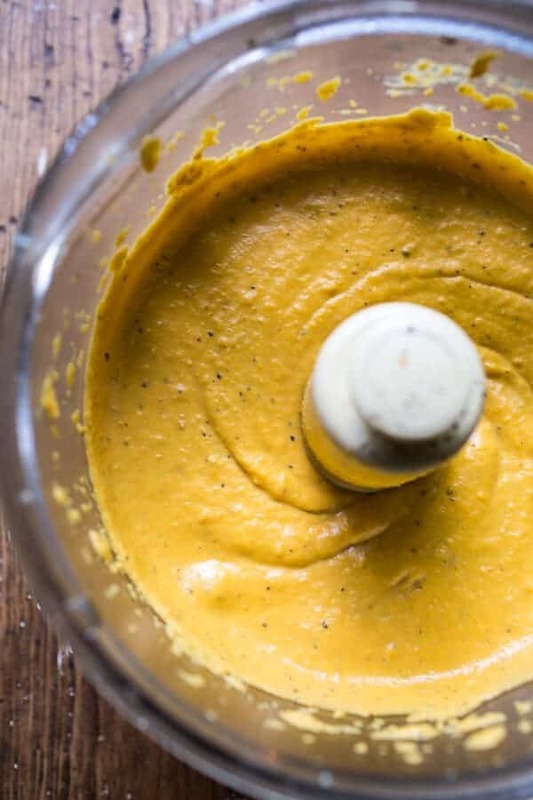 Transfer the squash to a food processor and add the goat cheese, parmesan cheese, egg and nutmeg. Puree until smooth. Taste and season with salt and pepper. Roll your pasta dough into lasagna sheets. I like to roll my pasta to the 5th setting, but all pasta machines vary. Heavily flour your ravioli mold or counter. Seriously, do not be afraid of the flour. Flour is your friend and without it your ravioli will stick to the mold (or your counter)! Lay one sheet of pasta on the mold, making sure the entire mold is covered. Now, if you have one, grab an egg and fit it into each well. This helps form a space for the filling to go. Remove the egg, now take a tablespoon of the butternut squash filling and place it into each well. Spritz the pasta sheet with a little water or use your fingers and dab some water along all of the ravioli edges. Lay the second sheet on top and run a rolling pin over to seal. Turn the mold over to release the ravioli. They will not be fully separated. Use a pizza cutter or sharp knife to cut them fully apart. Lay the ravioli on a parchment lined baking sheet and continue making ravioli until you've used all the cheese filling. Make sure to cover the ravioli with a damp towel as you work. At this point you can freeze the ravioli for later if desired, or continue on with the recipe. Heat a large skillet over medium heat and add the olive oil. Once hot, add the bread crumbs, oregano, salt + pepper and cook, stirring for 4-5 minutes or until toasted and golden. Remove the bread crumbs from the pan to a plate. Place the butter, remaining 1/2 cup oregano leaves and prosciutto in the skillet and cook over medium heat until the butter is browned and the prosciutto crisp. Remove from the heat. Boil the ravioli for 1-2 minutes or until they float. Carefully remove the ravioli from the water and gently stir the ravioli into the butter sauce. 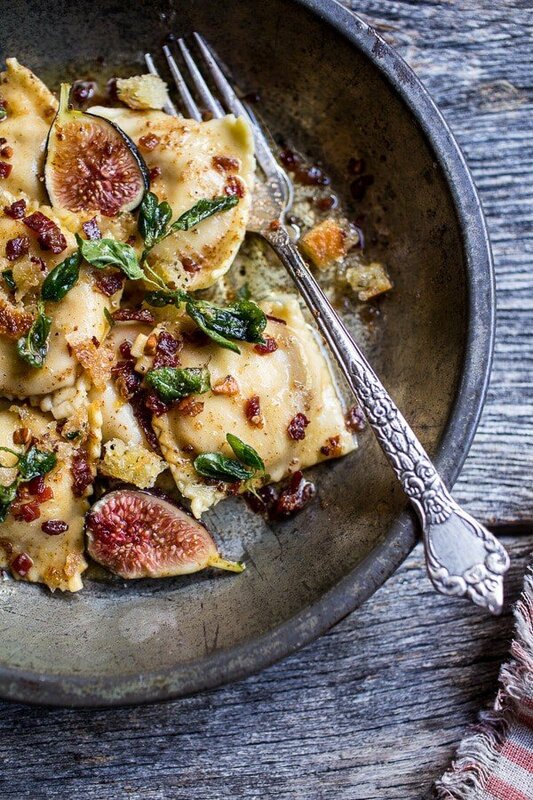 Divide the ravioli among plates and top with the breadcrumbs and figs. Serve immediately with goat cheese. Enjoy! 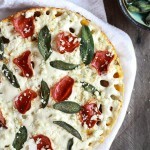 *If you do not like goat or gorgonzola cheese, you may use 7 ounces of your favorite cheese. Brie, cheddar, mozzarella and gouda would all be great! **If you do not have a ravioli mold, just make free formed ravioli like shown here. Aren’t these pretty? 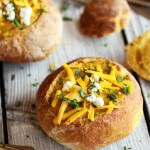 Like perfect little pillows of cheesy, butternut squash goodness. YUM. loved the video!! i never make pasta or ravioli from scratch, so it was fun to watch you do it. and yay for introducing asher to harry potter! i hope she loves it. The only time we tried making ravioli was an utter disaster. The dough was good, the filling was delicious, the shaping f the ravioli… not so much. 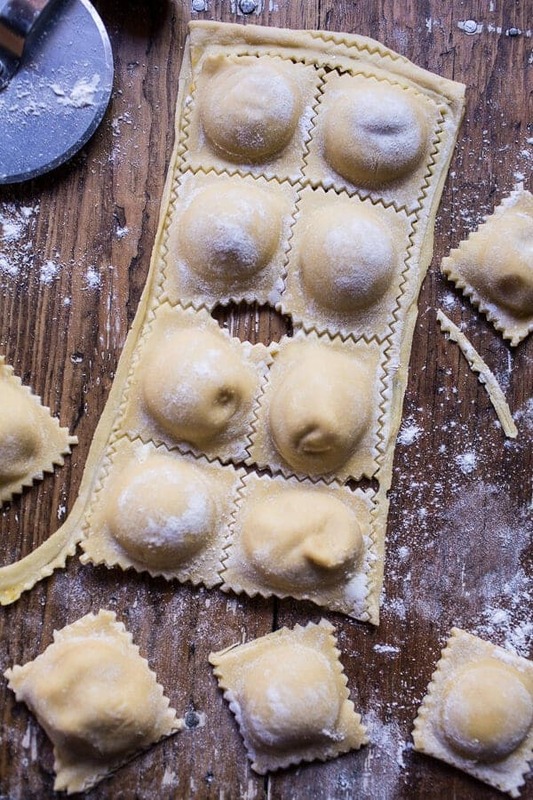 Need to get my hands on a set of ravioli making moulds. Thus said, I had a reaaaaally early breakfast this morning, and after seeing this am now ravenously hungry!! The video is awesome Tieghan and it’s so cool that you just posted a recipe for ravioli because my sister just asked me to try making it. This looks delish! Oh, and I may have to fly to your house and kittynap Snape. So ADORABLE! p.s. If you figure out a reliable source for that guy you mentioned, let me know! That’s a tasty looking bowl of pasta and good job on the video well shot. These ravioli those so good…and that video actually makes me think I can make them myself. Keep the fall recipes coming…can’t wait to see them all. Can I just say you are cutest EVER?! Like I kind of just want to be you….especially because your kitchen looks AMAZING. Mine doesn’t even have drawers…true story. ANYWAY. This ravioli. I love all things squash and carbs, so pass me a fork! Pinned! SEE so many great recipes likes this and no mushrooms. Pasta is a wonderful carb but I don’t move as much as your mom but I’m still going to enjoy it and pin this recipe. Love the video Tieghan! 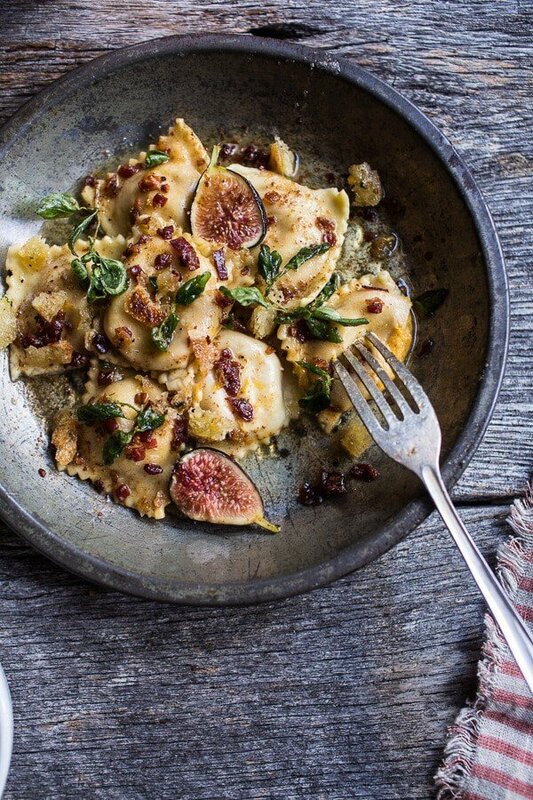 And the dish looks spectacular… the ravioli and the figs. Absolutely beautiful. I love your video! You should make them more often. The recipe looks awesome and will surely try it. You really have amazing ideas and your pics really do them justice. They look great. I hope that for the Christmas time that you’ll do some 3 course meal suggestions. Especially some Christmas desserts. They are always the hardest part of the menu. Have you ever considered to add a suggestion box? So that people can ask you to develop a meal with a certain ingredient? Okay, so I’m making a reservation right now for your future restaurant so I can’t be turned away, don’t forget 😉 Great video too!! Love this! And your video…that pumpkin seed scooper is genius! This looks so good! I have never tried to make ravioli on my own, but I have helped others. I need to try this recipe and see how it goes. Keep the fall recipes coming! Love all of them! Oh my gosh, Tieghan, you are so cute!! Loved the video! 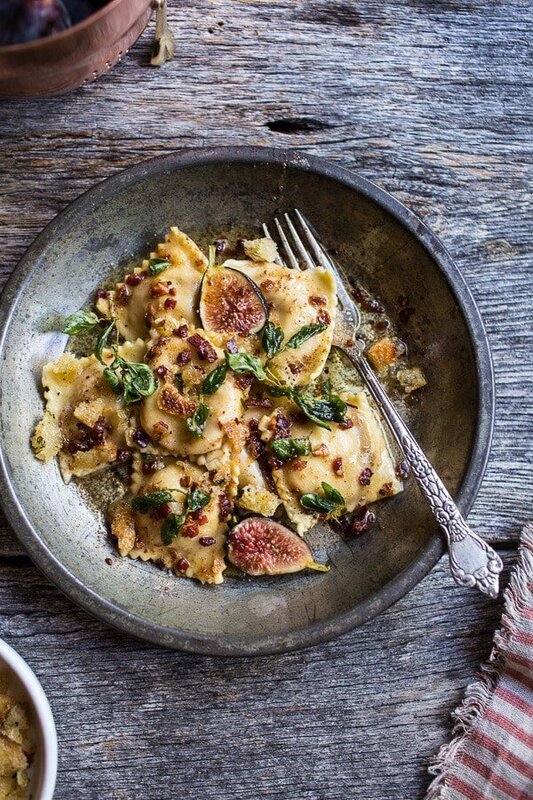 I am so impressed with this homemade ravioli, it looks amazing! Gorgeous plating! I love the way the figs are arranged with the goat cheese. The video was helpful too! Love this recipe! Thank you, Cassie! Hope you are having a great week! 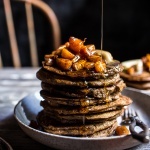 I am loving all the fall recipes, so keep them coming! This video wasn’t too long at all! I loved watching every second! I found your blog a couple of days ago by searching a recipe on Pinterest, and can’t stop visiting to read your posts and amazing recipes! Can’t wait to try some soon! What a fantastic recipe! 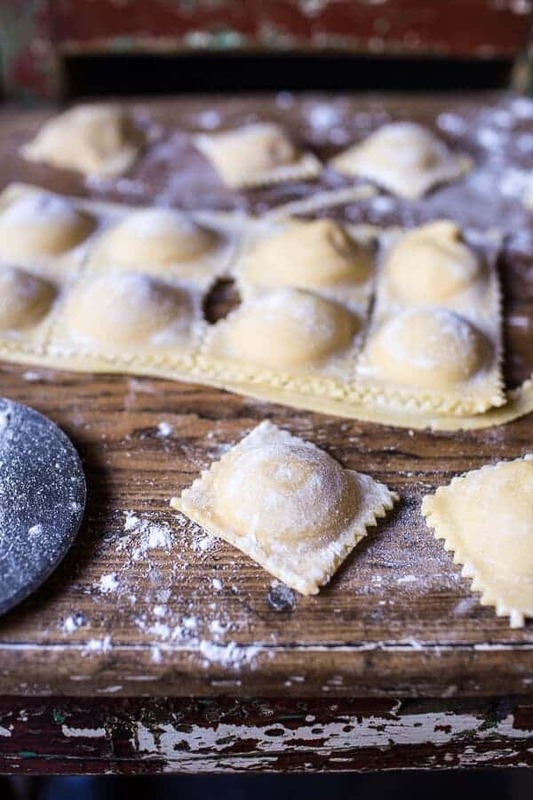 I’ve always wanted to know how to make ravioli, and you make it look so simple. Can’t wait this beautiful and gorgeous bowl of pasta! Thank you so much! yOu have to try homemade ravioli, it is the best! THIS. This is everything ravioli should be and more. Wonderful recipe, Tieghan! RIGHT!?!?!? Thank you so much, Lauren! Hope you are having a great week! Loved the video Tieghan! This looks so Fall! and so delicious! Need to get the pasta roller attachment for my Kitchen Aid! Oh my.. climbing on shelves!?!? I have two twin girls so that is not good news for me!! Please do post all those recipes as I’m sure I’ll love them all. Loved the video Tieghan! Bravo!! 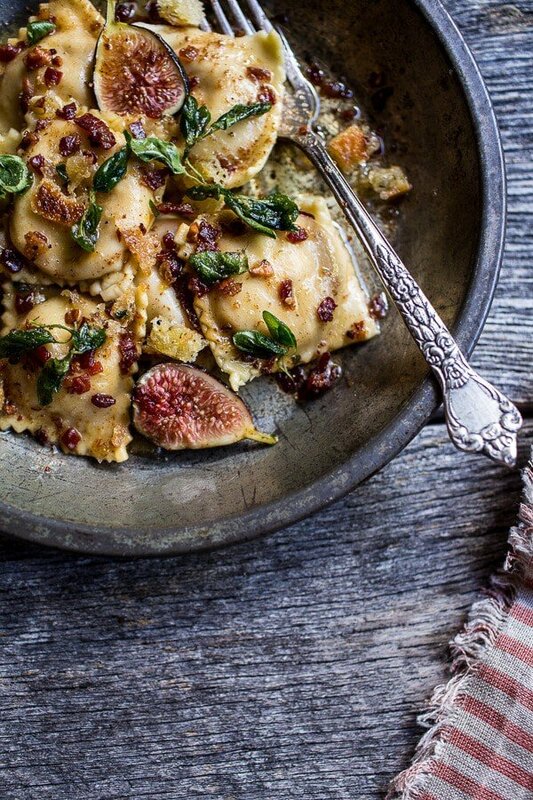 And this ravioli sounds absolutely perfect for fall! Need to get that attachment for my Kitchenaid! You make it look so easy! Thanks for sharing. Thank you! So happy you loved the video! Nice to see you working in person with your delightful recipe that if I see it on a menu want to order, but have always been intimated making it at home, and I have the attachment for the Kitchen Aid and have never used it! You made it look simple and it’s on the menu at home this weekend, I can’t wait. Very good instructions loved it and hope to see more videos. Ahhh!! that is awesome! I hope the pasta goes well and let me know if you have any question! THANKS! haha! Thank you so much, Debi! Allll! I loved the video Tieghan! It was great seeing you in your kitchen! Wow I really love how you included the video. 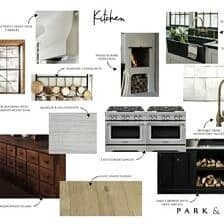 Also your kitchen is a dream. What a great place to let your creativity roam. Thank you for posting a video! I love watching you cook in real time…sort of. 😉 Great job and I’m excited that there may be more coming! Thanks Hannah! So happy you liked the video! Oh wow, thanks Laura!! I am clearly loving the fall recipe, so more are coming for sure!! What a great video, Tieghan! And I am loving this dish! Perfect for Fall. Thanks so much, Matt! Hope you are having a great week! OMG you’re video was fab!! You should so make more of them!! 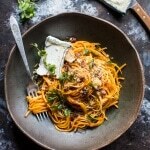 Love the recipe and all the fall inspired flavours, can’t wait to try it!! I really enjoyed the video! I could definitely see you having a show someday.. I am on the hunt for that drunken goat cheese now. Love this recipe! Thank you! So happy you enjoyed the video! Hope you love the ravioli! You have me itching to pull out the pasta attachment and ravioli molds. What a glorious pairing of flavors. I’m finally inspired to try out my new pasta attachment! My husband is not a squash lover but I’m wondering if this could turn him… If not, I’m thinking mushroom ravioli! Also I LOVE that you have a video to go with this recipe! It makes all the difference watching you so I will know what to do. You should make a YouTube channel for these! OH YEAH!! I hope you love the pasta! Thank you so much!! Super awesome video! Really well done. I so wish I had a chicken coup to go shopping from when I forget eggs! 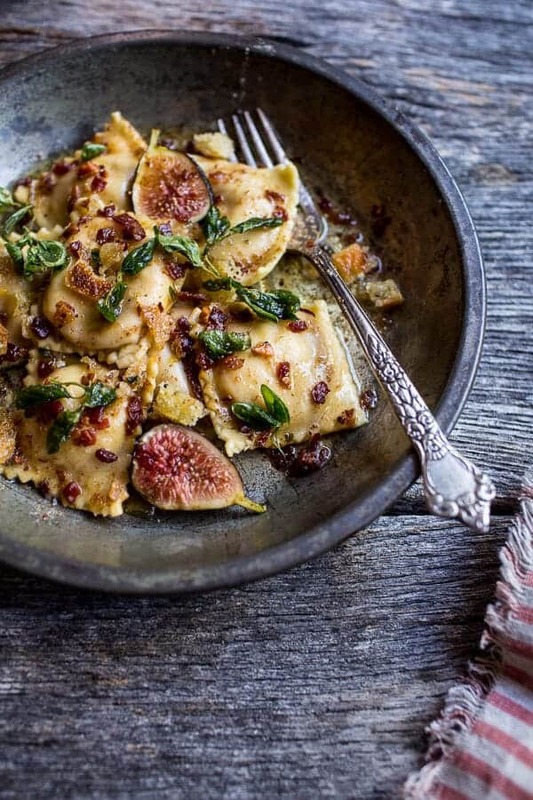 And fall+pasta = obviously! ? hehe! Thank you so much! Hope you had a great day! You really have the it factor to be on t.v. with more exposure and practice, you ‘ ve got what it takes to be on t.v. and all those chickens are cute and getting fresh eggs from the coop , that’s the kind of peaceful life I want. And it added character to the video, kind of show your life… your brother did a good job . 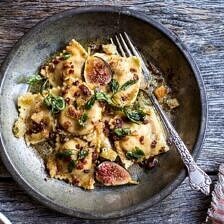 And the ravioli, looks so easy to make . I am tempted to buy a pasta maker…. good job, Tieghan. Love the video! This meal looks absolutely delicious. I’m thinking about investing in the Kitchen Aid pasta maker. I don’t make a lot of pasta from scratch but this looks too good to pass up! 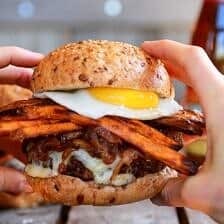 Oh my god this looks so delicious and the video makes it look so easy .. the video is so good please film more recipes because it shows all the steps and it makes cocking so easy. I have just stumbled across your blog Tieghan & it has been so much fun to get to know a little bit about you & see all that you are doing! 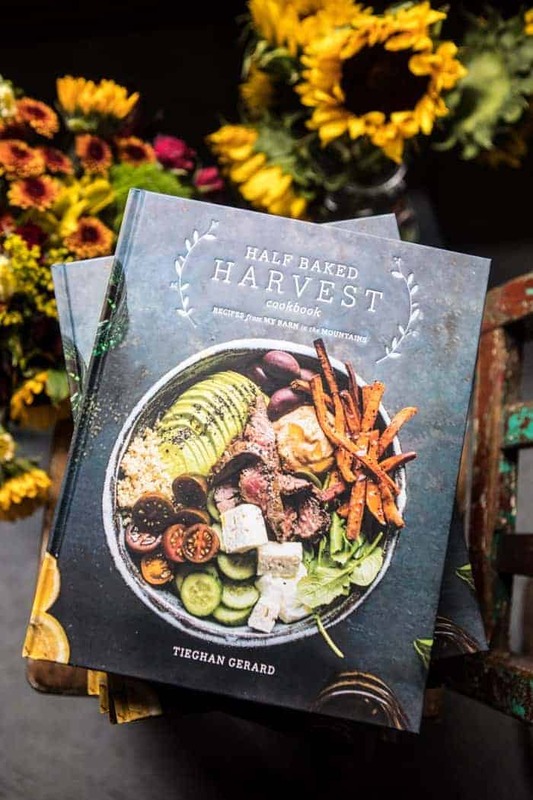 Love the Barn, & the recipes look amazing! I’m looking forward to getting in to my new Kitchen (also have been living through a building project 2+ years!! Getting water in the kitchen soon!!) & make some of these. I also, love the dishes that you use in your posts! 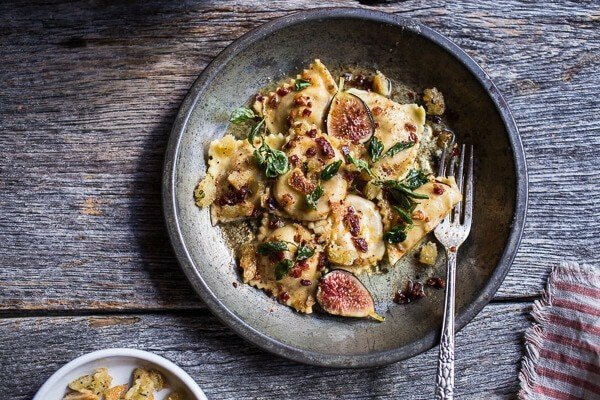 Can you tell me where you got the dishes/Bowl you are using with this Ravioli recipe? HI Connie! SORRY! Not sure what happened there but I fixed it, video is there! 🙂 Enjoy! Hi Tieghan!!! I made the ravioli recipe for my family tonight. I am in high school (haha probs one of your younger viewers) and I just love your blog. This ravioli is my favorite recipe of yours yet and I’m not going to lie I have made quite a few of your recipes. The combo of butternut squash and the variety of cheeses was the prefect combo. Loved the breadcrumbs on top (more carbs haha the best of course) and the prosciutto oregano sauce was spot on. The fam was all in agreement and loved in too! So glad it all worked out! I don’t own the kitchen aid pasta attachment so I used a handy dandy rolling pin and some mini muffin pans. They might not have looked as pretty as yours but the flavor was still all there! Thanks for all the great recipes and keep them coming! PS go you for hand rolling, that takes some serious effort!!! 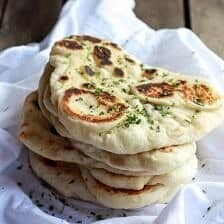 It is funny seeing this recipe everywhere on the web, it came out in a few restaurants now everyone is claiming it as theirs on blogs. LOL. It is a well done recipe similar to the one we have made at our establishment. I know it’s summer and this is more like a fall recipe but I just cooked it for dinner. It was soooo fancy and delicious!! I had never eaten fresh figs before and I really wanted to try it. What a wonderful discovery. I used the wonton wrappers and it went great. It was a bit long to make, but it was so worth it!! 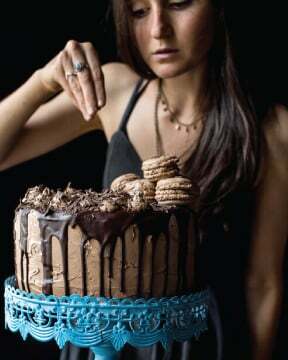 I am always so inspired by your recipes and photography.. now you’ve inspired me with your video! keep the awesomeness coming! Hi!! This looked delicious and I was so excited to make it but I’m wondering if the 3 cups of breadcrumbs should have been 3 Tbs instead?? I made it with 3 cups but it did not have a sauce as all the brown butter was soaked up by the breadcrumbs. Great flavors but something needed to be tweaked so that it actually has a sauce I think. I’m happy that I found your account! It’s a bit of work, but SO worth it. The flavors are incredible. Thank you for sharing this recipe. It’s a keeper. YAY! So glad it turned out great. Thanks Colleen! 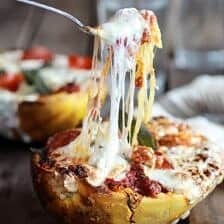 I am planning to make this soon, but wondering if it is 1 cup of butternut squash, or how much? Looks like a lot more in the video and wasn’t sure because it says 1 cups and about 4 in brackets. Can’t wait to try this recipe – looks amazing! Thanks! Awh thank you so so much Scarlett! I would do fresh sage leaves fried until crisp instead of the oregano. Otherwise, this looks insanely delicious. I am so glad you like it! Thanks Annice! Thank you Helen! I am so glad you loved this recipe!